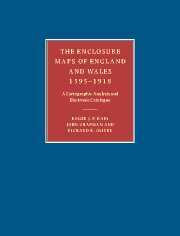 This electronic catalogue of enclosure maps of England and Wales is accompanied by a printed book, Roger J. P. Kain, John Chapman, and Richard R. Oliver, The Enclosure Maps of England and Wales, 1595-1918 (Cambridge University Press, 2004). Enclosure maps are large-scale maps mostly dating from before the mid-nineteenth century which record much valuable information about the rural landscape. They provide a record of parish and township boundaries before major changes took place, of enclosed and open fields, of farms and settlement forms, and of rural land ownership. For local historians concerned with the history of particular places, such maps can provide a first point of reference in retrogressive enquiries. Although modern historians tend to view large-scale maps essentially as sources of data on past economies and societies, enclosure maps had a much more active role at the time they were compiled. Seen from this perspective of their contemporary society, enclosure maps are not simply antiquarian curiosities, cultural artefacts, or useful sources for generations of future historians. Enclosure maps were instruments of land reorganisation which both reflected and consolidated the power of those who commissioned them. This database and the associated printed book derive from a five-year research project funded at the University of Exeter by the Economic and Social Research Council and work at the University of Portsmouth financed by The Leverhulme Trust. It is conceived as a sequel to Roger Kain's and Richard Oliver's The Tithe Maps of England and Wales: A Cartographic Analysis and County-by-County Catalogue, published by Cambridge University Press in 1995. This website contains a fully searchable, descriptive and analytical catalogue of all the parliamentary and non-parliamentary enclosure maps known by us to be extant and available for inspection in public archives and libraries between 1993 and 1997 when the fieldwork for this project was undertaken. In the printed book we discuss the processes of enclosure, assess the role of maps in that process, discuss the mapping of each county, illustrate a number of maps, and analyse the cartographic characteristics of enclosure maps across both space and time. There is also an index which lists every map, provides some key descriptive information about each, and contains links to the fuller information about each map in this database. Comments from users of the catalogue/database are welcome. Please email Profesor Roger Kain.